submissions and ingestion specialist Metaflow. The deal allows publishers and operators to upload content into the growing Mplayit eco-system with even greater ease. Building upon Mplayit’s existing partnerships with top-tier content providers and operators, Metaflow’s submission software and services will provide the default process for loading content into Mplayit’s backend platform. This will allow mobile publishers to quickly and easily launch online demo versions of all their games and apps, streamlining the procedure and integrating it fully into their existing operator and app store submissions workflow. This announcement comes as Mplayit continues to expand its publisher roster and launches new services in Europe. Mplayit provides games and apps discovery and merchandising solutions to mobile operators and on social networks. The company is partnered with leading global publishers and delivers services to them and mobile operators including Sprint, AT&T and Cellcom. Its web storefronts are integrated with leading social networks like Facebook, MySpace and Bebo, as well as with microblogging and linksharing services like Twitter and Digg. These 'Mobile Arcades' allow users to discover, demo, buy and recommend their favorite games and apps to their friends, all from their web browser. Since its founding in 2006, Metaflow's tools have become the industry standard in content submission and deployment, taking much of the complexity out of the content submission process, removing the traditionally highly manual process of content submissions and greatly increasing productivity and deployment capacity. Mplayit is the leading global provider for online discovery and social merchandising of mobile games and applications. The company’s proprietary software solutions enable mobile content providers to better merchandise, market, and interact with a targeted user audience of mobile consumers. Mplayit is based in Ashburn, Va., and is backed by New Atlantic Ventures. For more information, visit www.mplayit.com or email info@mplayit.com. You can also follow Mplayit on Twitter: @Mplayit. 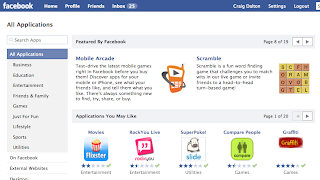 Mplayit Mobile Arcade is now a Featured App on Facebook! I'm really proud of the engineering and product development team at Mplayit. We've all been working hard creating a great experience in Facebook for the discovery of mobile content. Today Facebook recognized that effort. On top of our 'verified app' status, Facebook has now decided to feature the 'Mobile Arcade' as an application they recommend. Great work guys. If they like us now, they will love our plans for the future! Mplayit from Craig Dalton on Vimeo.